What does MovNat look like at home? Here is one simple, thoughtful solution. I’ve been fortunate enough to hang out with Collin Beggs, a timber framer in his early forties, in his home town (and my former home) of Sandpoint, Idaho for the last week. Collin is a longtime friend, fellow MCT, and an ongoing student of mine via MovNat Online Coaching. 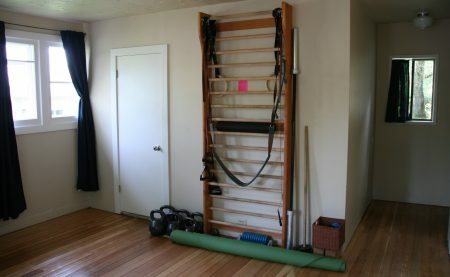 One thing that really stood out to me about how he approaches his MovNat practice is the simplicity of his at-home setup. I personally know many aspiring MovNatters really struggle with finding the right space and setup for training. While most of us understand that we can technically MovNat anywhere on the fly – in nature, at a local gym, or even our own homes – sometimes the lack of uniform structure, appropriate/available tools, and dedicated space can lend itself to discouragement and/or inconsistent practice. For this reason, I think it’s very important to carve out a special, easily accesible space with versatile training tools for practice. And Collin has done just that in very minimalist and “do-able” way. He arranged them in a way that flows with the landscaping of his backyard. Collin used a sharpee pen to mark the weight and arranged them roughly from biggest to smallest. He uses these rock as objects to lift, carry, and throw, as well as intensify any movement by adding extra load. He also uses his more stable rocks to jump and land on. 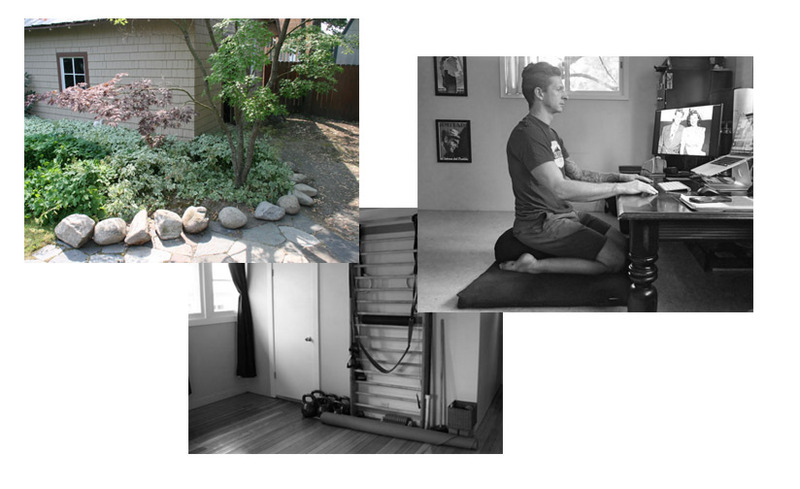 Collin is blessed to live in an area that has beautiful, mature trees to use for various techniques, but he also has a few simple setups for movements that require a wide, horizontal surface. None of the trees in his yard would suffice so he uses a 2” wide steel bar that he “jerry-rigged” to the ceiling of his garage. He also uses a simple log structure that houses his winter firewood stores for climbing on wider horizontal surfaces. While I was here, I showed him how to do remedial drills right on a standard door that is secured well to its doorframe inside his home. Nothing fancy here folks. A few standard 2x4s for flat surface training and a variety of narrow logs for rounded surface and more complex training. For the narrow logs, he uses tent spikes and drives them into the ground in a wedge shape to house the rounded logs in a few places along their length. He says the remaining instability creates a nice, natural effect without being too unstable to train safely on. While Collin certainly incorporates ground movement and other natural movements to challenge/improve his range of motion in his outdoor space, he often begins his practice inside. And, as evidenced by his burly collection of kettlebells, his practice sometimes stays there especially during the long Idaho winter season! He uses the MovNat mat for gentle ground movement sequences, along with various myofascial release tools and a simple structure for convenient post-practice stretching/release. If you can balance on it, you can jump on it. And, often if you can lift it, you can also jump on it. So, while Collin doesnt have any specific equipment for jumping, he has a nearly endless variety of options. Likewise, he used a mix of traditional tools and more natural loads for lifting, carrying, and throwing. As a business owner, Collin spends plenty of time behind a computer screen (don’t we all?). 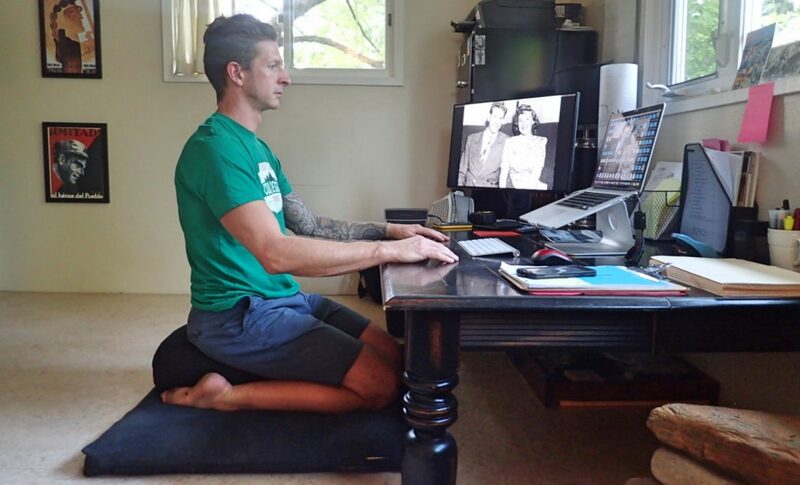 To avoid the negative effects of prolonged elevated sitting, he shortened the limbs of a table as a makeshift computer desk and uses a pad/bolster combination that was formulated for Zen meditation practice (a “Zafu and Zabuton” found here). His living room is furniture-free, but his kitchen table and outdoor furniture are fully intact to help maintain the comfort of his guests. Not much. Collin stacks some heavy slabs of timber on top of each other for vaulting and I just started showing him how to combine a vault with a slap landing from his elevated porch railing. He’s luck to have a nice park with trails nearby for running and more playful, extemporaneous, and free form practice. Admittedly, keeping his practice diverse and engaging is a challenge in the winter for him, but we are working on cycling his focus to match the seasons as well as getting him used to the idea of occasional outdoor winter sessions. With a little motivation and resourcefulness, the rewards of consistent and deliberate movement practice can be accessible to everyone and anyone. 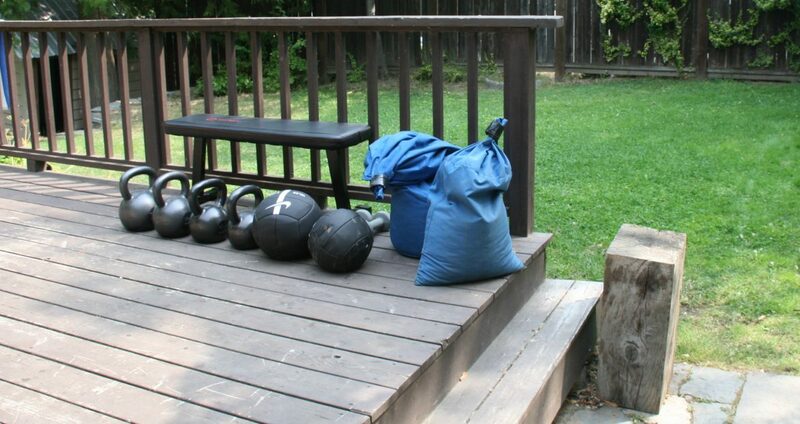 I hope Collin’s simple setup is a catalyst to spark some inspiration for those looking for at-home training options. Great tips! This gives a ton of ideas for creating our own MovNat environment in the space of a modern home. Thank you. Hi.Do you know if we have any of these natural movement setups in western australia?